Texas Children's Hospital Logo. Image available on the Internet and included in accordance with Title 17 U.S.C. Section 107. Photograph, Texas Children's Hospital in 1953. Image available on the Internet and included in accordance with Title 17 U.S.C. Section 107. Texas Children's Hospital Buildings at the Texas Medical Center. Image available on the Internet and included in accordance with Title 17 U.S.C. Section 107. 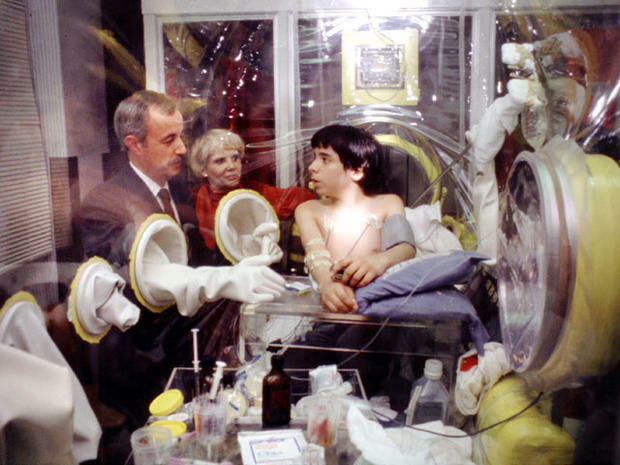 David Vetter, or the "Bubble Boy," speaks to his doctor, Dr. William Shearer, from his isolator containment center. Courtesy of the Baylor College of Medicine and CBS News. Image available on the Internet and included in accordance with Title 17 U.S.C. Section 107. TEXAS CHILDREN'S HOSPITAL. The Texas Children's Hospital, an internationally recognized children's hospital, is a full-care pediatric facility in the Texas Medical Center in Houston. Texas Children's Hospital was opened in 1954 and is the primary pediatric training site for the Baylor College of Medicine, which operates one of the largest pediatric residency programs in the country at Texas Children's. By 1993 more than a million children had been cared for there. In response to increasing numbers of patients, the hospital initiated a $149-million expansion program in 1989 to construct two new buildings: the five-story West Tower, which houses critical-care and surgical services, and the twelve-story Clinical Care Center. Renovation of the hospital's original structure, the Abercrombie Building, was also included in the expansion program. With the expansion, Texas Children's became the largest freestanding pediatric hospital in the United States. Its medical staff in 1993 consisted of more than 1,000 physicians and dentists and some thirty fellows-licensed physicians who have completed their residency training and are studying pediatric subspecialties. They were joined by more than 3,000 highly skilled nursing and support staff. Together, Baylor and Texas Children's also operate the nation's only Children's Nutrition Research Center, a United States Department of Agriculture facility that researches the nutritional needs of pregnant and nursing women and of their children from infancy through adolescence. Texas Children's was the first hospital in the nation capable of prenatal diagnosis of cystic fibrosis and is the site of a Cystic Fibrosis Treatment and Educational Center. The hospital's neonatology service was the first private neonatal-care department in Houston, and from 1987 through 1993 had a 60 percent survival rate among patients weighing between 1 and 1½ pounds. Cardiologists at Texas Children's Hospital have treated more than 50 percent of the children in the world who are known from published medical journal reports to have heart arrhythmias. The hospital was also the first pediatric facility to acquire a heart-mapping system, which allows physicians to determine the site of an arrhythmia with sixty-four simultaneous electrocardiograms. The hospital includes several research centers, including the David Center, which was established in 1984 to honor David, the twelve-year-old also known as the "Bubble Boy," who died of a rare immune-system disorder. The David Center is dedicated solely to treating immunological-deficiency diseases, especially those involving the development of cancer. Texas Children's Hospital had 456 licensed beds in 1993. Handbook of Texas Online, "TEXAS CHILDREN'S HOSPITAL," accessed April 25, 2019, http://www.tshaonline.org/handbook/online/articles/sbt06. Uploaded on June 15, 2010. Modified on July 13, 2017. Published by the Texas State Historical Association.